Most important respiratory pathogen of infancy. Passively acquired maternal antibodies provide no protection. Can infect upper and lower respiratory tract. Symptomatic reinfection occurs throughout life. Children with pulmonary or cardiac disease can have serious morbidity from infection. Yearly reinfection is common throughout life. 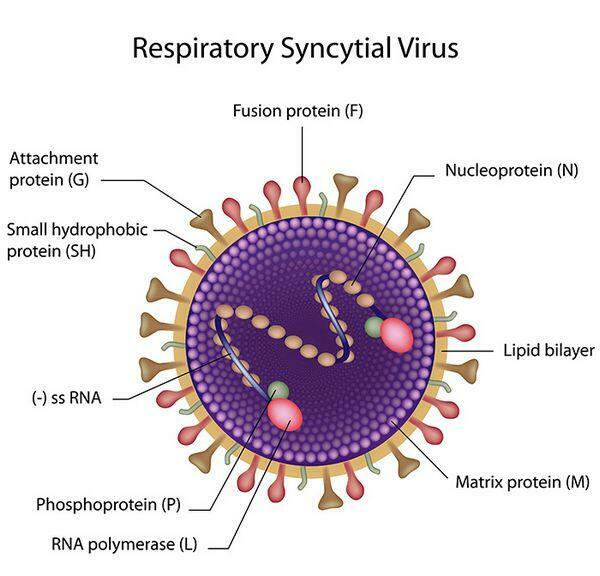 Respiratory syncytial virus (RSV) produces a yearly epidemic in temperate climates. Most commonly, it causes bronchiolitis but can also cause upper respiratory infections, tracheobronchitis, and pneumonia (Table 1). In the United States, RSV activity is greatest from December through April. Some variation occurs year to year. The epidemic lasts from 2 to 5 months. Essentially all children are infected during the first 3 years of life. Yearly reinfection is common throughout life. The virus is responsible for ~90,000 hospital admissions and 4,500 deaths/year in the United States. RSV is a 120- to 300-nm enveloped RNA virus of the Paramyxoviridae family. It is in the genus Pneumovirus. The viral RNA encodes 10 proteins, 7 of which are structural (F, G, L, M, N, P, and SH). Two antigenic strains have been identified and are differentiated based on the G surface glycoprotein. The epidemiologic and clinical significance of the antigenic variation is unknown. The virus is very labile regarding temperature variation; however, the lability of this virus does not reflect on its high degree of communicability. The virus is transferred via droplet nuclei, direct contact, and fomites. The virus has been shown to remain viable on fomites for hours and on the human hand for = 30 min. Nosocomial infections are very frequent and warrant strict adherence to hospital isolation procedures. RSV adheres to and invades the respiratory epithelium. It has an incubation period of 2-8 days. The virus spreads cell to cell via intracytoplasmic bridges. It has potential to cause pathologic changes along the entire respiratory tract. Pulmonary pathology commonly noted during autopsy of infants with RSV bronchiolitis includes peribronchiolar mononuclear infiltration, epithelial necrosis of bronchioles, luminal plugging, airway hyperinflation, and atelectasis. Patients with RSV pneumonia also show evidence of mononuclear interstitial infiltration. Bronchiolitis is an acute respiratory illness affecting primarily infants (Box 1). 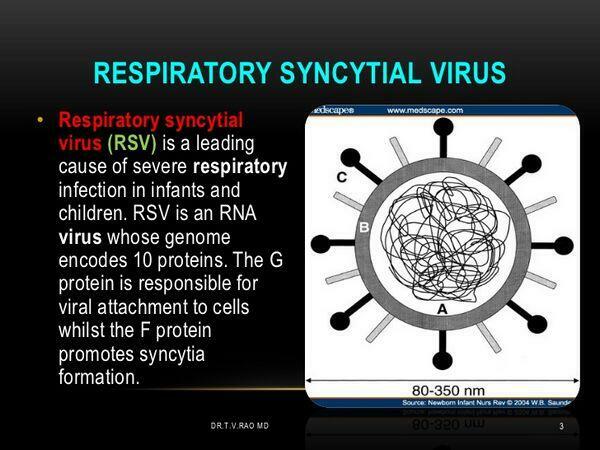 RSV is the most common etiology. Patient ages range from 6 weeks to 2 years, with a peak incidence from 2 to 6 months of age. Presenting symptoms commonly include low-grade fever, clear rhinorrhea, tachypnea, cough, and expiratory wheezing. Hypoxemia and respiratory failure may occur in advanced or complicated cases. Dehydration may be present owing to increased insensible fluid losses and poor intake of fluids. Viral isolation and antigen testing are performed from nasopharyngeal washings. Instillation of 1-2 cc of sterile saline in a nasal passage followed by prompt suction with an in-line suction trap will obtain a good specimen. Culturing requires 3-5 days and is optimal on human heteroploid, monkey kidney, human kidney, and fibroblast cells. Viral antigen can be detected with an immunofluorescence assay or enzyme immunoassay. Chest radiographs commonly display hyperinflation. Occasionally atelectasis or diffuse infiltrates are seen. The differential diagnosis of bronchiolitis includes pneumonia, asthma exacerbation, foreign-body aspiration, and noxious-chemical inhalation. In healthy infants, the disease lasts 3-7 days. Children with an underlying pulmonary or cardiac disease can have prolonged courses lasting weeks. Recurrent episodes of wheezing may occur in = 50% of infants infected by RSV. The wheezing may last until 3 years of age. Pneumonia from RSV typically occurs in infants and the elderly. Typical presenting symptoms may include fever, dyspnea, tachypnea, and hypoxemia. Diffuse, fine rales may be auscultated. Same as laboratory findings for bronchiolitis (above). Chest radiography demonstrates diffuse interstitial infiltrates. Exclusion of a bacterial etiology may be difficult. Patients with underlying pulmonary, immunologic, and cardiac disease are at risk for serious morbidity. Diagnosis of most RSV infections is based on physical and radiographic findings (see Table 1). Rapid antigen detection is often helpful, especially in compromised infants. Evidence of hypoxemia at presentation warrants aggressive therapy. Therapy is aimed at maintaining oxygenation and adequate air exchange. Supportive care is effective in the vast majority of cases. Tachypneic infants will have increased insensible fluid losses. Intravenous fluids may be needed if dehydration is present. Nasal suctioning to maintain clear nasal passages is warranted in all infants. Oxygen should be provided immediately if hypoxia is present. Bronchodilators may provide some benefit in bronchiolitis. Mechanical ventilation is indicated if signs of respiratory failure are present. Corticosteroids will benefit if the patient has asthma. Immunoprophylaxis is highly effective if used appropriately (Box 2). Administration of ribavirin should be reserved for severe, refractory cases and infants compromised by cardiac, pulmonary, or immunologic disease. A history of prematurity also warrants consideration of ribavirin use. Ribavirin does interfere with some mechanical ventilators and small endotracheal tubes. Extreme caution should be observed with its use. Thorough hand washing will limit the spread of RSV (Box 3). No vaccine is currently available. Immunoprophylaxis is effective in high-risk infants. Droplet isolation of the hospitalized patient is indicated. Strict isolation may be indicated in some hospital environments. Hospital isolation procedures should be strictly enforced. RSV is a common source of nosocomial infection. Symptomatic children should be excluded from school or daycare. Viral shedding usually lasts from 3 to 8 days after the onset of symptoms. Rare cases may shed virus for as long as 4 weeks. Table 1. RSV clinical findings.